Getting a MAKEover: Part I…Taking the First Steps! Recently, a member of my PLN, @jrosenberg6432 asked me a few simple questions about the development of our middle school makerspace. I’ve been trying to wrap our progress into a neat little bundle, but I came to the conclusion that it’s big and messy! There’s SO much that encompasses how our learning environment is getting a MAKEover, from the physical space to the mindset. The culture itself is getting a MAKEover. So, I decided to break the responses to @jrosenberg6432‘s great questions into a few separate posts…maybe one step towards neater little bundles (let’s at least pretend!)? The development of our makerspace has been a work in progress since around last February when we purchased some initial kits and introduced them to our after school Tech Club (check out my original post). We decided to start with Tech Club so that we could determine how long it would take students to complete projects and to observe things like perseverance and innovation. This also allowed us to get feedback on what activities sparked middle school interest the most and how they handled challenges. At the beginning of this year, we actually started to use the term “makerspace” in our school. Instead of Tech Club, we introduced it as “Tech Club in the Wildcat Makerspace.” I’m hoping we will be able to change the name totally next year and just call the group the “Wildcat Makers or Wildcat Makerspace.” With the introduction of this new terminology, we still continued to focus on the after school club because I was the sponsor and could roll things out at a faster rate and it was still about the education piece of helping people understand what the Maker Movement is all about (check out Dale Dougherty’s TED Talk: “We are Makers”). Also, it allowed us to push out to all grade levels at once. We had about 50 students show up at our first meeting of the year with this new terminology! Last year, I had about 20 students at the first meeting so this was a decent jump. I have to immediately acknowledge my colleagues @oconnorscience and @ajsullivan77 who joined me as co-sponsors to make some magical maker things happen for our students! With the energy that was created in our first few after school meetings this year, I worked with the technology facilitator at the other middle school in the district to submit a grant to a local community organization. Prior to this, we received a small grant from our PTA which allowed us to buy additional kits and consumable materials, but we were ready to take a big jump! Our initial grant that we submitted to our local community organization focused on beefing up STEM opportunities for our students with a Makerbot and Cricut. Our vision from the beginning has been to infuse this maker culture into all classrooms by integrating these technologies into all content areas. Therefore, we connected with a variety of content area teachers in each of our buildings and they joined in on the grant. The organization was so excited about our plan to integrate these technologies, that they asked us to submit a wishlist of our dream materials…how often does that happen?! 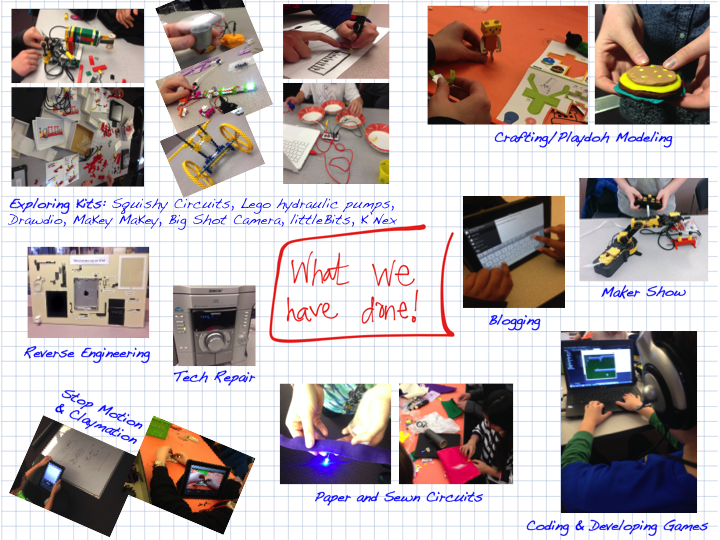 The fine folks of #MakerEd helped A TON in finalizing our wishlist materials. When the decision was final, we actually ended up receiving $30,000 in grant funding. It’s important to understand a bit more of our context- we have about 900 students in each of our buildings and we planned for the materials in our grant to last a minimum of two years. We did discuss submitting a Phase 2 of the grant which will focus on the design of the space as well as additional tools (sewing machine, video setup including boom mic, etc.). We are incredibly lucky to have this support and funding and we do not miss a beat in counting our blessings. My office is in our library. I never really felt that the space was mine at all until getting our librarian (a colleague who I work closely with) on board for the whole makerspace initiative. We discussed it, she went to a librarian’s conference and heard about the impact it had on circulation and she was ready to go! This allowed us to start making changes in the physical layout of the library. I don’t have a very good image of what it looked like when we started, but I’ve included a semi-decent one below. Imagine that to the right of this image are these large wooden study carrels. Think of our library as a silent and isolated space. Slowly, we began to alter the physical space after getting administrator approval. This came with the knowledge that the space would become collaborative…and if there was ONLY one thing we accomplished this year, it would be to get rid of those study carrels! They represented the antithesis of the culture shift that we were trying to make. We first started by moving some book shelves around to create a little nook-like space. The librarian and I joke that everything in terms of furniture in the makerspace came from the garbage- and it’s partially true. We didn’t have any funding for furniture itself (the grant did include $ for storage, but phase two will focus on design), so we had to get thrifty! Just by taking walks around the building and looking in some spaces that stuff seems to pile up in, we were able to accumulate a coat rack for lab coats and safety gloves, half-circle tables, a curved table, two monitors, and other odds and ends. We also began collecting items like lamination scraps, broken tools/tech, cardboard, Styrofoam, and bubble wrap. The pics below show where we’re at today. 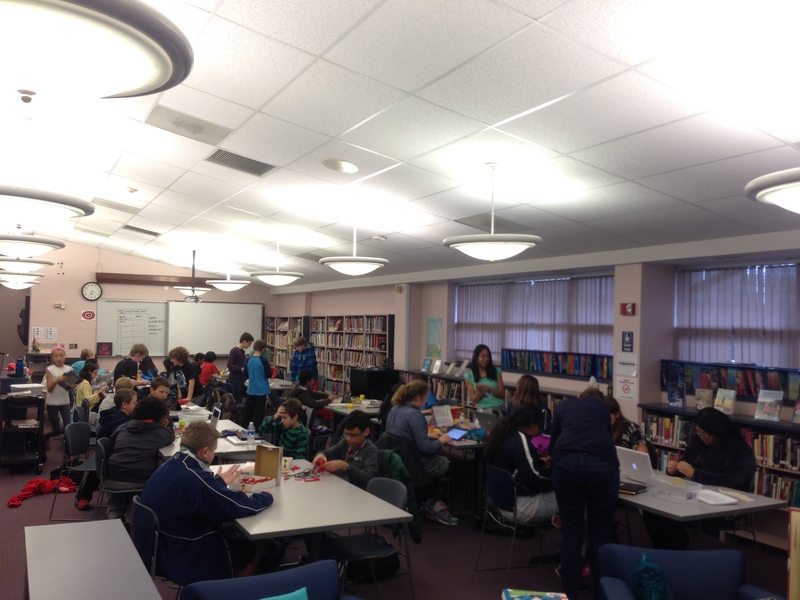 Our makerspace now takes up almost half of our library! We wanted to make the space interactive to stimulate curiosity, play, and creativity. We took paper and covered the tables, set up a MaKey MaKey tinfoil piano on the back of a bookshelf, and used lamination scraps to create a “Doodle Wall.” Because of the buy-in from our librarian, she was able to clear out some books and dedicate shelves for materials. I can’t tell you how amazing this has been as a storage solution! The excellent part is that everything is accessible and easy to grab and go- which is exactly what we want. I keep the tools and needles locked in my office so that we know where those are at all times. Safety first! I still look at it as being in the start up phase. We are always thinking of ways to improve the space…someone walked in a few weeks ago and said, “I swear this place is always changing.” We took it as a compliment over confusion because what was once a stagnant space is now dynamic and flexible. Our end goal is to have every day be a maker day – not just after school one day a week. For example, we want to carry out our vision of integrating materials into daily lessons in all content areas (see our grant examples here) and @oconnorscience created a makerspace corner in her classroom with legos, puzzles, and random items after seeing what was going on in the library. We want to infect the building with this spirit and energy 🙂 We are in the process of transitioning from the Tech Club mainly using the items, to publicizing that everyone has access now that we have more materials in from our grant orders. Students have been coming to create on random days, in addition to our Tech Club meeting. We are going to label the material boxes with QR codes that attach to a Google Form sign out sheet so that students know that they are able to check out the materials in the space and create at any time, while still being held accountable (can’t take home for now, just use in the space or in the classroom). We don’t want to make it too formal because we want to encourage random tinkering, but we do want students to know that the expectation is for every piece to come back so that others can play later. If I had to pick 2 words to represent the initial phase of implementation, they would be VISION and COMMUNITY. Without both, it would have been a challenge to get this maker party started! Getting a MAKEover: Part I…Taking the First Steps! by Candace Marcotte is licensed under a Creative Commons Attribution-NonCommercial 4.0 International License. 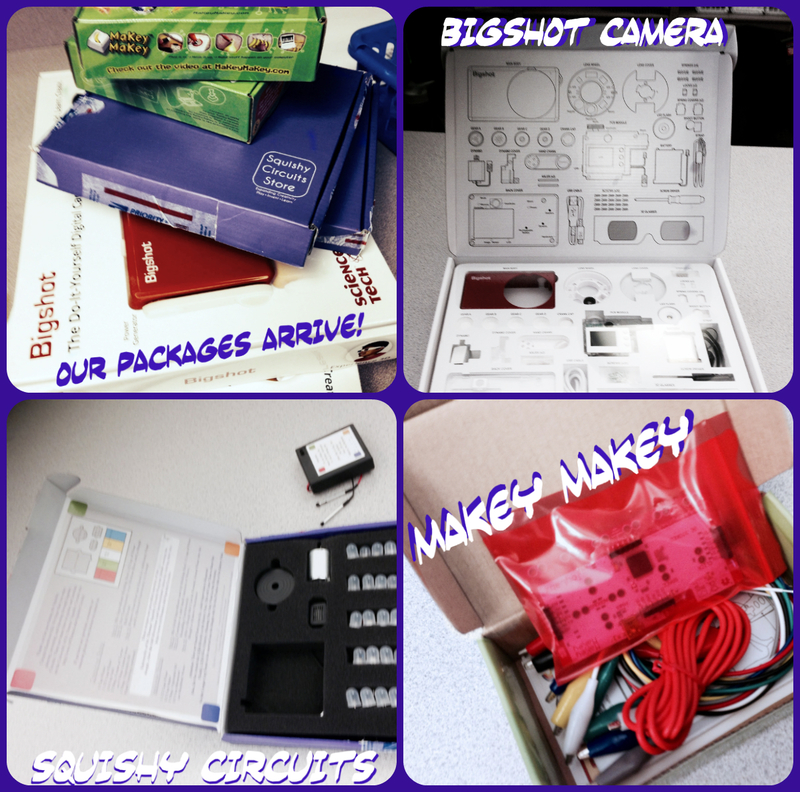 Categories: MakerEd | Tags: maker, makered, makerspace, STEM, Wildcat Makers | Permalink. If you’ve never been to a Maker Faire or Mini Maker Faire, I recommend jumping in and finding one near you to attend. I’ve had the opportunity to attend 2 Maker Faires in Detroit and just attended my second Mini Maker Faire- the Chicago Southside Mini Maker Faire. While attending a Maker or Mini Maker Faire, you will be exposed to creativity, genius, and connected learning galore! As educators, there is also a lot to learn from the Maker mindset. Check out this post from Makezine.com on how they believe it can transform education. Hand in hand, the Maker culture also serves as a great connection to STEM and STEAM…and there are a plethora of resources you can scoop up for your classroom by attending one! Click the Maker Faire poster on your left to see my favorite highlights from the Chicago Southside Mini Maker Faire. 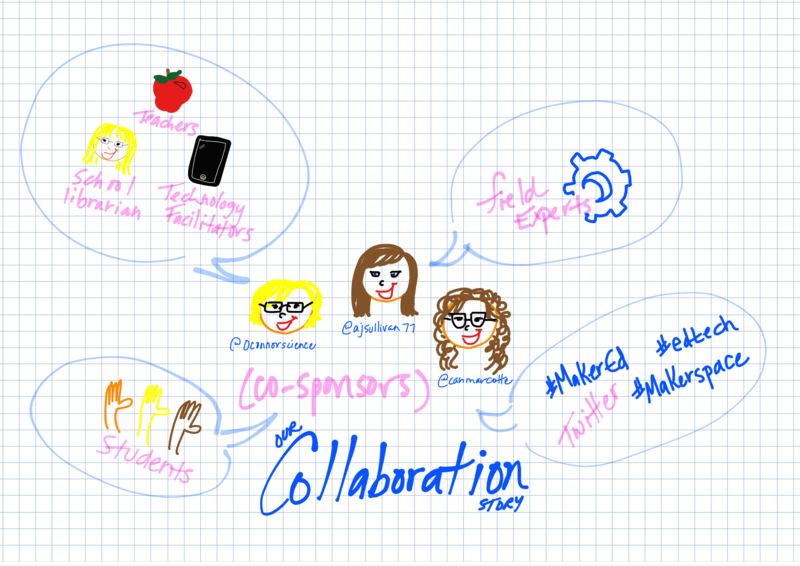 Categories: MakerEd | Tags: chicago, maker, maker faire, resources | Permalink. With my time in Michigan State’s Educational Technology program, the “Maker Movement” has really captured my attention. Two years ago, I went to my first Maker Faire in Detroit, Michigan. Since then, I’ve been to three different Maker Faires. This idea of creating, repurposing, and innovating blows my mind when I see examples of the way Makers view common items. Makers seem to have the perspective of life as an ever-evolving masterpiece or they see the potential to turn standard items into a contraption that measures the wavelengths in the electromagnetic spectrum (just an example, but a true story!). As the Maker Movement is getting more attention in the educational field, this Maker spirit was re-energized within me at a recent #PLAYDATE Chicago. Using MSU and PLAYDATE as resources, I purchased the following resources to utilize with students. Students were eager to get started! The directions that I gave them were to use the resources they have at hand (written directions that came with product and the Internet). I told them that I’d only help if they got into an extreme bind. Here are the results after 45 minutes! 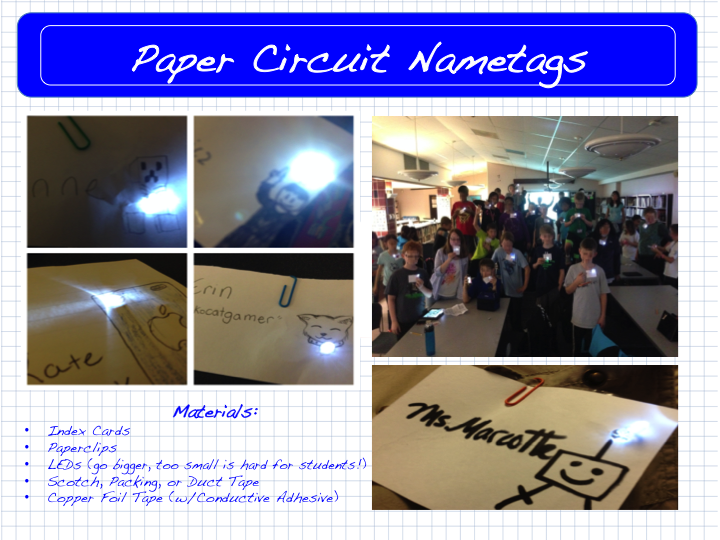 Science: Circuits and energy conversion. They haven’t learned about the types of kinetic energy yet, so we were able to discuss it in terms of the Bigshot Camera because it starts with mechanical energy and is transformed into electricity. Science: Importance of observations and documenting your experiments. Students began to tape the building process for later reflection. ELA: I introduced how these could compare to the writing process and students elaborated on which parts were like a rubric/prompt, brainstorming, editing, peer review, etc. Art: Squishy Circuit students began to mold their Play-Doh® into animals to follow the directions of making LED illuminated animals. Music: Makey Makey students began to create keyboards to play songs. This calls for knowledge of notes, pitches, and rhythm. Collaboration: We saw happy hands and lots of them involved! There were no angry or greedy hands, but true teamwork and collaboration were emerging. …More to come after we have our next go round after Spring Break! Categories: In the Classroom | Tags: maker, STEM | Permalink.